The search continues for the missing Apollo; a fleet genetics scientist announces the startling results of his studies to the Council of Twelve. An unknown number of days have past since Apollo's disappearance during the battle with the Somnians, but the search continues. Meanwhile, Adama learns that the Council of Twelve has been secretly meeting without him and fears they will try once again to oust him as leader. Elsewhere, Starbuck, Athena, and Sheba are in a shuttle surveying a nearby planet for signs of Apollo. Suddenly, a gigantic beast looms up ahead of the low-flying craft and knocks them out of the air. Far out in space, the Imperious Leader receives a communication from Vulpa Six that he is returning with a captured alien who can help destroy the humans. Unknown to Imperious Leader, Vulpa Six has already been destroyed and the message was faked by a pair of intergalactic bounty hunters. On the unnamed planet, Starbuck awakens to find himself in the company of a tribe of rat-like humanoids. They inform him that his friends are believed to have been captured by the Goratha and if he wants to rescue them, he must assist their warrior Razad in obtaining a talisman of great power called the Riah Stone from the Goratha and thus he may find his friends as well. Back at the fleet, a special meeting of the Council has been called and Commander Adama is informed that Dr. Resik, of the fleet's genetics research team, has been working with the forbidden data of Dr. Ravashol's cloning experiments. Dr. Resik now believes they can use a recent breakthrough in their research to build the perfect human being and become the dominant race in the galaxy. Adama is outraged that they would want to place themselves in the position of the divine by tampering with creation and possibly even leading humanity down the same path that ended the original Cylon race. After a heated argument, Sire Kolan ends the meeting and declares they will reconvene in one centar (hour) to vote on the matter. The stress of the council's revelation, along with the disappearance of first Apollo and now Athena, has left Adama feeling lost. He takes a shuttle to the Bethlada, where he enters a place of worship to be alone and pray. But he discovers an old clergyman friend there named Civitan that he had thought was killed or left behind on Caprica. Civitan counsels Adama not to lose faith. On the planet, Starbuck and Razad begin their hunt and soon encounter the Goratha, a large, hairy, white beast and Razad easily kills it. But then they find themselves surrounded by a number of the beasts, even larger than the first. On page 1 (the inside front cover), Commander Adama's log tells us it is the Colonial yahren 7356. This does not seem to jibe with either the earlier Realm Press comics (in "The Law of Volahd" Part 1, Adama's log says it is 7324), nor the more-or-less official BSG Timeline as seen on the Battlestar Wiki. Adama also states in his current log that it has been nearly two yahren since the rag-tag fleet's flight from the Colonies began. However, it is stated in "Lunar Won" that it has been one yahren since the destruction of the Colonies, and this story does not seem to take place so long after that. For purposes of continuity, it's better imagined that Adama says "a little over one yahren" in his log instead of "nearly two yahren". As I deduced for both "Lunar Won" and "The Law of Volahd" Part 1, it is still 7349. In his log on page 1, Commander Adama remarks that the fleet is composed of 220 ships. As we know from our past episode studies of BSG, there are currently only 215 ships as last updated in "Take the Celestra". It would seem that a number of probes have been launched over the ensuing days since Apollo's disappearance in an attempt to find him; Adama's log indicates that he has learned that the Council has met in secret without him several times since Apollo's disappearance. On page 5, Giles appears for the first time since "The Lost Warrior". Page 7 indicates that Vulpa Six was the Imperious Leader's First-in-Command. 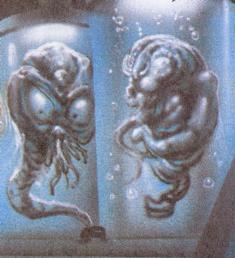 Page 7 also indicates that the two aliens met by Vulpa Six in "Prison of Souls" Part 3 are intergalactic bounty hunters. What are the creatures held in fluid suspension in Dr. Resik's lab on page 9? Are they remnants or clone attempts of the Somnian creatures created by Dr. Wilker under Somnian control in "Prison of Souls" Part 2? Dr. Resik and the Council reveal to Adama that the fleet's genetics research team have been working with data from Dr. Ravashol's cloning experiments. Dr. Ravashol is the human scientist who was misguidedly working with the Cylons in the two-part TV episode "The Gun on Ice Planet Zero"; on the Cylon ice planet, he had created a community of male and female clones who, unknown to him at the time, had begun to breed. Several times in this and the previous Realm Press issues of Battlestar Galactica, the members of the fleet seem to refer to themselves as still being in their own galaxy, even though the TV episode "The Long Patrol" states that the fleet has moved into a new one. After the rat-like humanoid (revealed in "Search for Sanctuary" Part 2 to be a Kara) tells Starbuck he must face the Goratha creature with Razad in order to rescue his friends (Athena and Sheba), Starbuck amusingly says to himself, "Why should I be surprised? I should be used to this scenario by now..." He is referring to numerous other stories previous in which he has crash-landed on a planet and been forced to help the locals take on their enemy (such as "The Long Patrol" and "The Young Lords"). On page 19, Adama takes a shuttle to a ship named the Bethlada, where he visits a place of worship. Why would he need to travel off the Galactica to find such a place? Doesn't the Galactica have at least one room set aside for religious purposes? Is the Bethlada a special ship designated for worship? On page 24, Starbuck remarks, "I've got a bad feeling about this..." This may be an homage by the writers to the Star Wars saga, which frequently has characters use this phrase (or a variant thereof). How did Starbuck become separated from Athena and Sheba? They were all on the same shuttle when it crashed. Why wouldn't they all have been taken together by either the Karas or the Goratha? If the clergyman Civitan on the Bethlada was an old friend of Adama's, why did he not let the Commander know he was alive and well? When they meet here, Adama remarks he'd thought Civitan was lost when Caprica fell.